Google brought in its Android one initiative in India , this September for the first time to conquer the emerging low cost market which was hold upon by companies like nokia,micromax,karbonn,xolo etc. So the company launched 3 devices having micromax, karbonn , spice on board. these devices were meant to bring mid range flagship specs at an affordable cost with timely android updates. Updates in consideration to which Google has failed to offer since it's already a month since the release of the madness called ''Android Lollipop" and yet there's not even an official call on these devices yet not even any dates announced specifically by google , wonder why they had given the tag : ''First to receive android updates ,as soon as the next version is released''. Since the launch of these devices via Indian e- commerce sites like Flipkart, Snapdeal ,Amazon sales were not ground breaking due to the cheaper devices now heavily acquired by the smartphone venders like Xiaomi. The phones launched by Xiaomi were essentially having hardware specs better at the same price point than Android one devices. So Google's waffling around to find the next bet in low cost devices, as this is the part for them left to be acquired.. 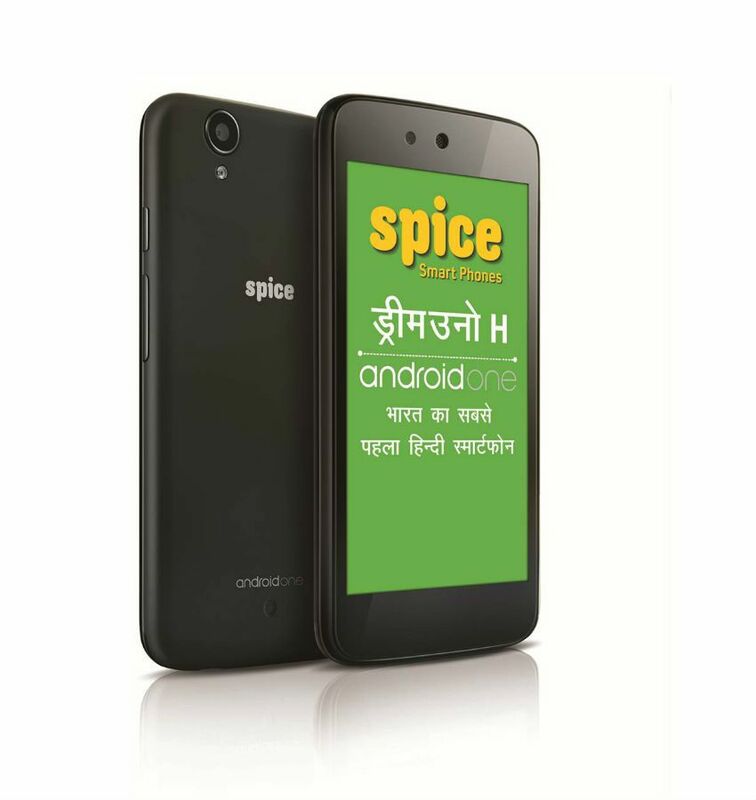 Hence a new Android One phone has been launched today by Spice named Spice Dream Uno H.
Spice dream uno H is essentially the same phone as that of Spice dream uno having same specs like earlier 1.3Ghz Quad core Mediatek MT6582 chipset coupled with 1GB of Ram ,Having the same 4Gb of on board internal memory expandable via MicroSD slot, has 4.5 Inch FWVGA(480x854) IPS display with 218 ppi ,5mp rear camera capable of 1080p HD recording @30fps & 2mp front camera which records 720p HD Video and has a battery of 1700mah capacity! THE ONLY DIFFERENCE IS NATIVE Hindi language all over , basically this is the first Smartphone from Google to be powered with hindi language everything from apps upto sms,settings etc .To Conclude Complete Hindi Support , High Regards to Google For making this Phone , Completely Native Indian :D .
Wonder whether if this (hindi support) could uphold their sales against Xaiomi in India! You can buy Spice Dream Uno H(MI-498 H) today on Snapdeal at just Rs.6110.